Yes, I know the plural is just “moose,” but it’s more fun the other way. And no, I haven’t encountered a moose or any other interesting wildlife yet. I sure hope to, though I can do without any up-close bear confrontations! This is going to be an interesting trip. I am not sure when I’ll be able to update my blog on any given day. I have a lot of golf planned at all sorts of hours, so my days aren’t quite as “scheduled” as I normally have them on these vacations. 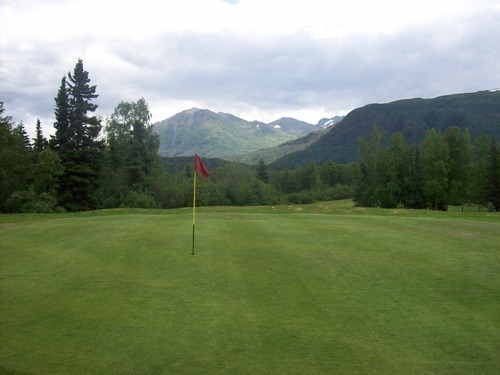 Oh well, that’s part of the fun in visiting Alaska, where golf is definitely much more casual. 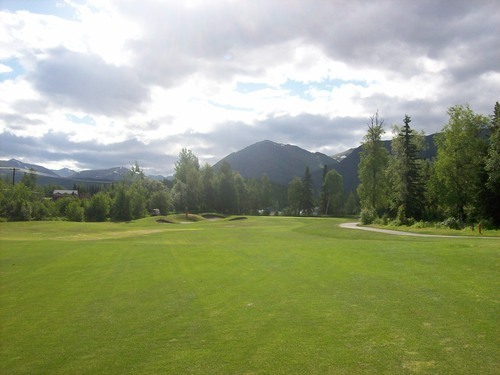 In case you’re wondering, the “JBER” stands for “Joint Base Elmendorf-Richardson.” Alaska has plenty of military presence and several of the courses I’m playing this week are military courses, including Moose Run. 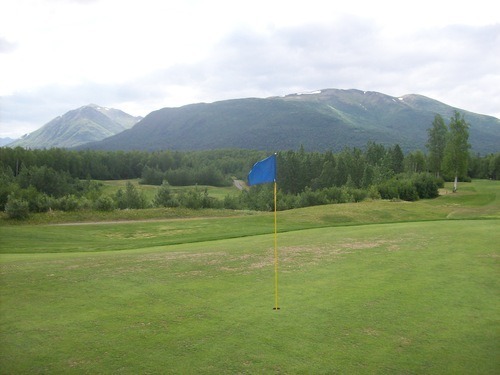 Information is limited on most Alaska courses, but Moose Run’s Creek Course is generally at or near the top of the handful of state rankings lists I’ve seen when researching this vacation. 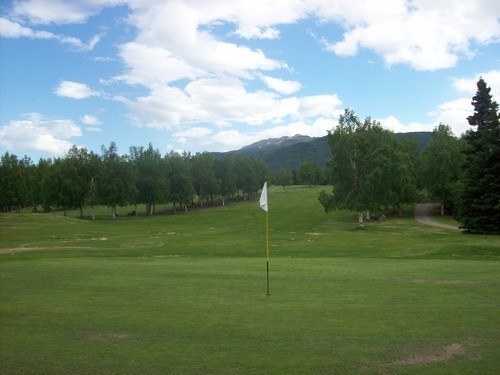 With two 18-hole courses, you’d figure it was one of the better facilities. I started late this morning on the Creek Course because they were having a big tournament on the Hill Course. I was able to walk right out and teed off by myself at about 9:30. I played through one foursome and then caught the other groups ahead. The pace was still quick, though, at about 3 hours. The cost was $63 with cart, which is a little more than I expected on a weekday, but not too bad. When I came back around, the tournament was over on the Hill Course, so they gave me a replay rate of just $15, which was great. 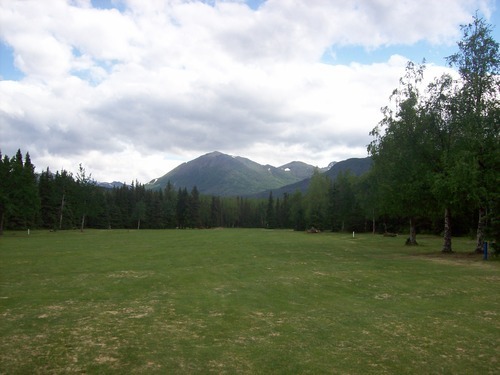 I teed off right away and didn’t see a soul in front of me, so it was a brisk sub-two-hour round. 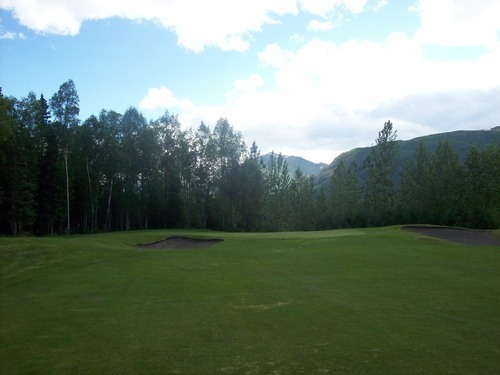 There’s no doubt the Creek Course is considered the better of the two courses at Moose Run. There’s definitely much more visual appeal and design “contour” that just makes it a more compelling track. 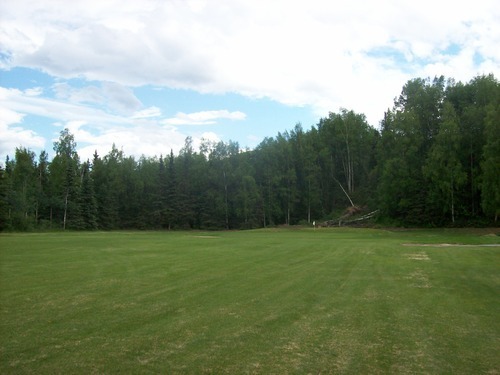 It is a nice layout winding through a forested area. 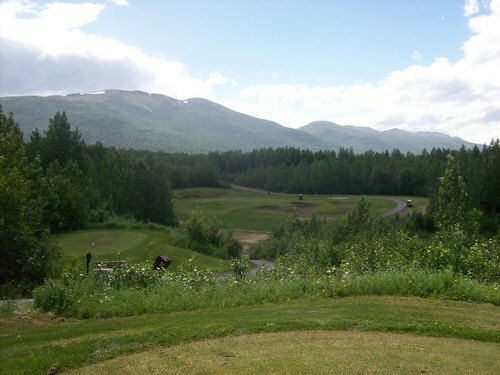 There are no significant changes in elevation, but the scenery around the course is certainly nice. There’s a creek that cuts through a handful of holes. It looks cold, deep and fast, so you definitely wouldn’t want to fall in. 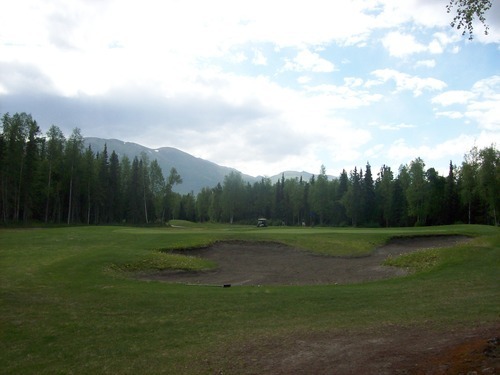 It’s a very peaceful and secluded setting, which is what you’d want and expect from an Alaska course. 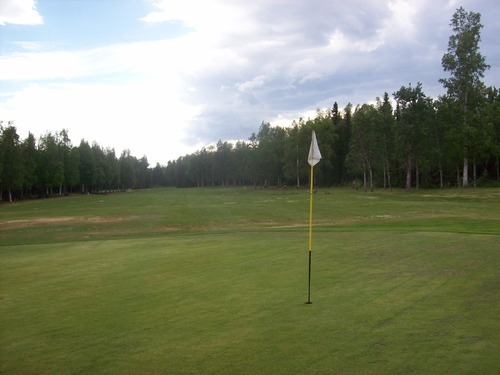 There are a few tricky holes and some big doglegs, but mostly the course is pretty forgiving as long as you don’t spray your ball way off course and into the woods. The greens are relatively small, but they are easy to get at whether you play a low ball like me or come in from a higher angle. The conditions weren’t great, but I had low expectations coming in. From what I understand, they had an especially late and long winter season this year, so the courses were coming around a little slower. I don’t really know what this place looks like at its “peak.” For me, it was very playable and looked good enough. 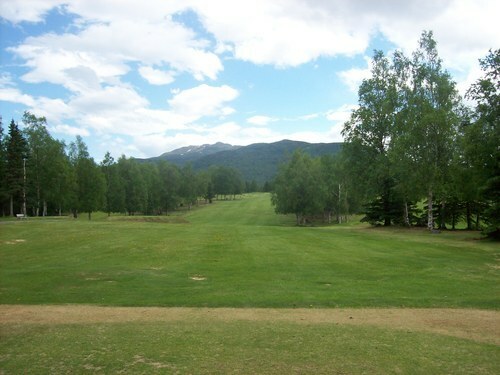 The fairways and rough were pretty patchy with plenty of dead spots in play. The greens were pretty bad. They were very shaggy, bumpy and slow as the grass continues to come in. Reading putts out here was pointless. 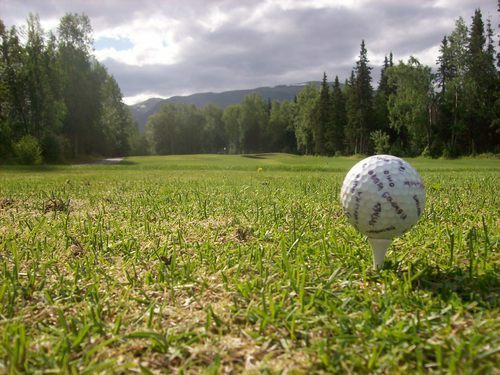 I would just aim my ball in the general direction of the hole, hit it as hard as I could and hope it caught all the right bumps to knock roll in. They told me that a big storm last year hit this course hard. 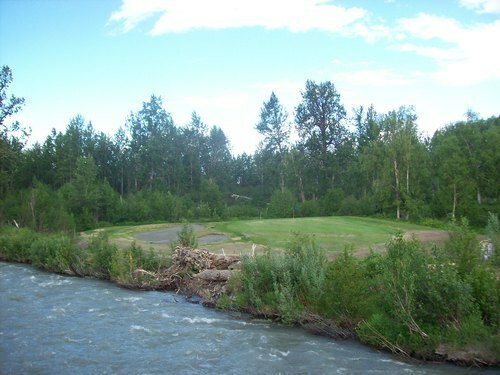 The flooded creek washed out one of the main bridges and they had to re-route the course because of it. 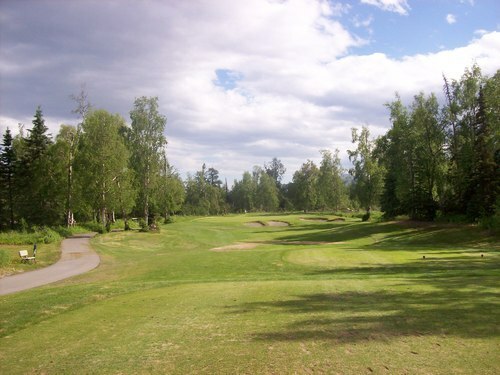 It also altered a handful of holes, including the par-3 12th. 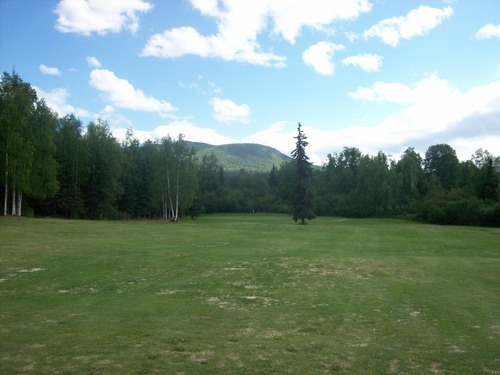 It used to be a long hole playing over a marsh. Now it’s a 50-yard silly little hole. 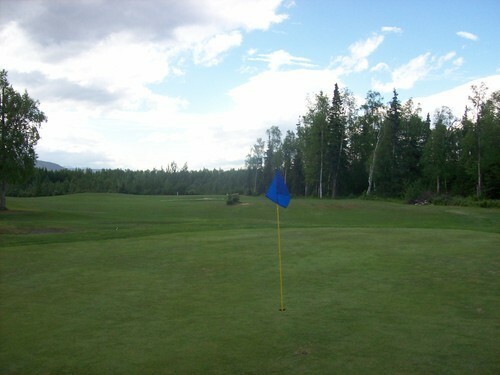 And, like a handful of holes on both courses, it was playing to a small temporary green this early in the season. The temporary greens at Moose Run are odd as they are tiny with somewhat shaved down turf and big holes (about a foot wide). It was kind of fun to be aggressive with chips because anything close will go in. Still, it was very hard to take any of these seriously and the altered yardages weren’t marked anywhere, so it was hard to know what to hit compared to what the normal green measures out to. 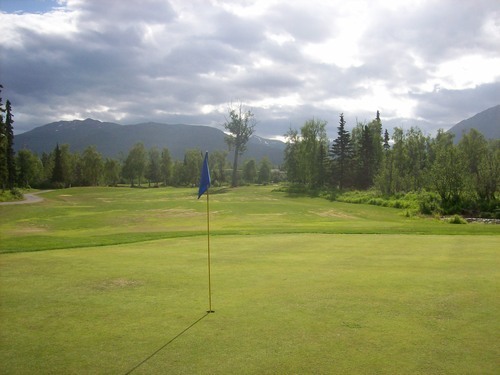 I guess that’s all part of the adventure of playing golf in Alaska in June! The official “Bogeys Across America” ball gets teed up below on the par-3 3rd hole. 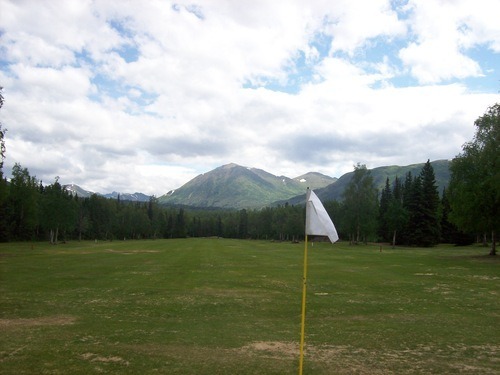 It’s now been played on at least one hole in 28 different states and even two provinces! 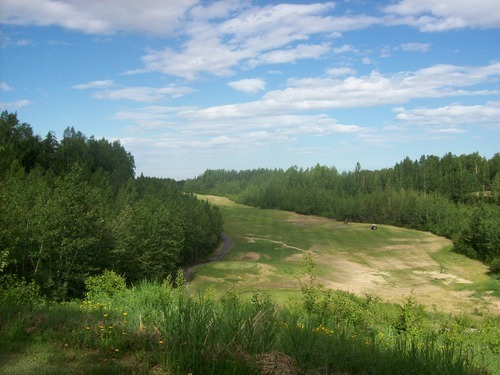 On all levels, the Hill Course is definitely less interesting than it’s bigger brother. It’s clear they put a little more effort into the original design of Creek, as well as the ongoing conditioning. 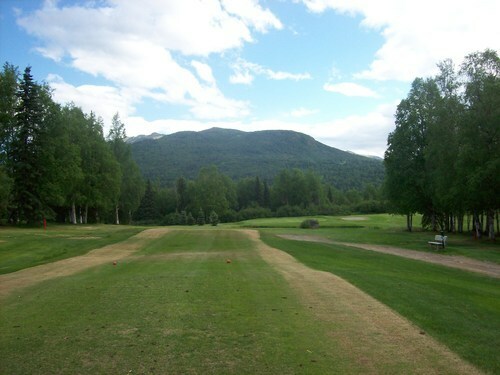 Condition-wise, it was similar, but the fairways were less defined and a little more unkempt. The greens were about the same, but some had some great patches where the grass has come in nicely and gave me a little glimpse of what the putting surfaces can be here when things are good. 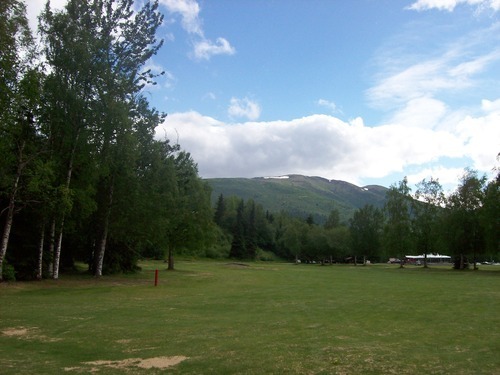 The front nine of Hill lives up to its name with a fun layout that features some elevation changes and a mix of uphill and downhill shots. There are lots of big doglegs to work around. 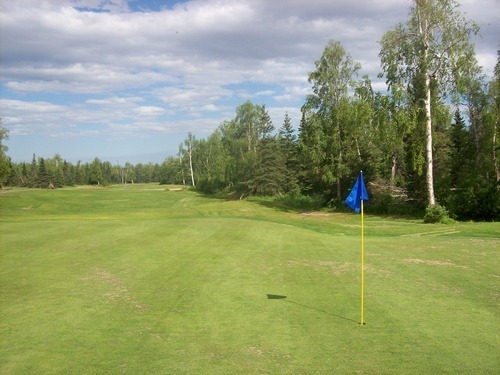 The fairways are very wide and forgiving and most greens don’t have much protection at all. Overall, it’s a very “friendly” layout that won’t punish you too much. 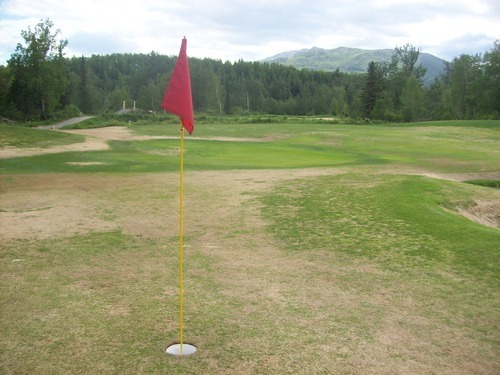 There are only two sets of tees on this course—white and red. That said, the whites are over 6,500 yards so it’s not a rinky dink design by any standards. You can “grip it and rip it” on most every tee, though! Whereas the front nine on Hill is pretty fun, the back nine is quite boring. There is nothing resembling a “hill” on this side. It is flat, wide open (and I mean “WIDE” open) without much trouble to get into. 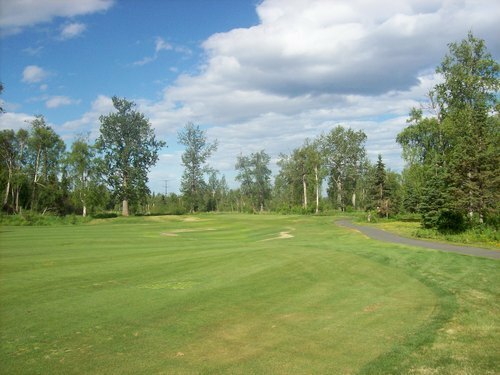 The most intriguing hole is the 18th, which is a short risk/reward hole that tempts you to hit over a row of trees on the left and right at the green instead of taking the safe/long way around the big dogleg left. I’m just happy my back held up on the Hill course. The only paved paths are by tees and greens and even they are pretty beat-up. 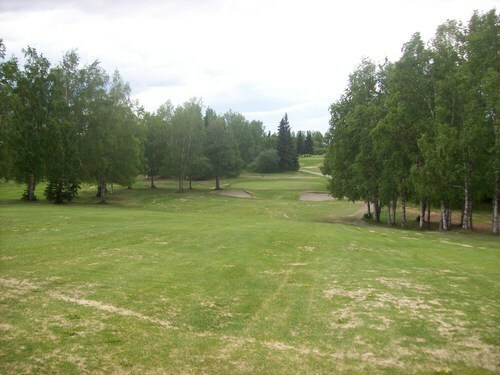 The fairways and rough areas are extremely bumpy and I was getting tossed around like a rag doll in the sluggish gas-powered cart. For the $15, the Hill Course was worth the adventure, but I would definitely recommend the Creek Course if you are just there to play one of them. I hope my reviews didn’t come off too negative or disappointing. 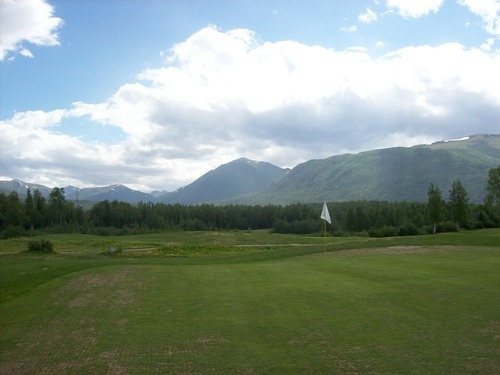 I knew coming into this trip that none of the courses in Alaska are known for stellar conditioning or jaw-dropping layouts. 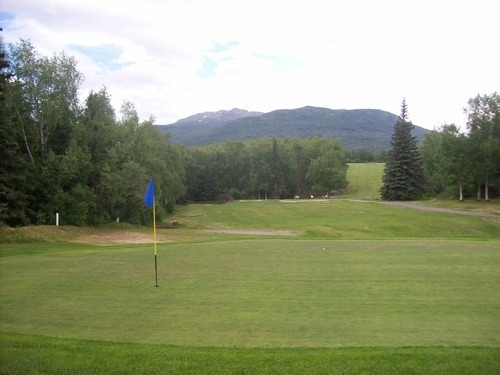 These are not “resort” courses because golf is not one of the top hobbies up here and the season is very short. 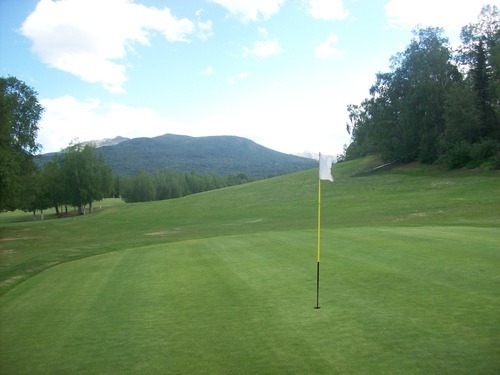 I can’t imagine it’s easy to manage the turf on these courses that are covered with snow for a majority of the year. For me, this trip is about experiencing what this unique state has to offer, so I don’t plan to get too hung up on conditioning. In fact, I was pretty stoked that there was as much green grass as there was out there today! Not great compared to what we’re used to, but better than expected. I just wanted to provide a sense of what it’s like in case you are thinking of coming up here. I doubt I’ll comment much about conditions the rest of the trip unless they are surprisingly good or especially bad somewhere. 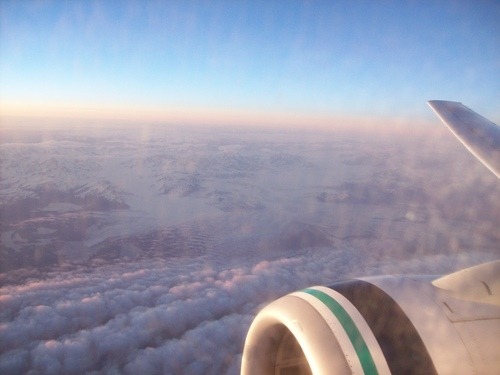 Lastly, I have to comment on my flight up to Anchorage last night. It was a long direct flight from Los Angeles, but what gorgeous views! I couldn’t have picked a better time to fly out (7:30pm). I got some great dusk views all the way up through California. It started to get a little darker through Oregon and Washington, but then started getting lighter again as we got into Canada and then Alaska. 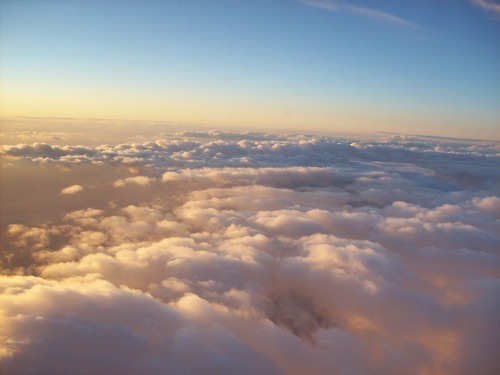 Big mountains, glaciers, icebergs and crazy cloud patterns with a glowing pink hue–spectacular! By the way, those pictures were taken about 11:30pm local time!